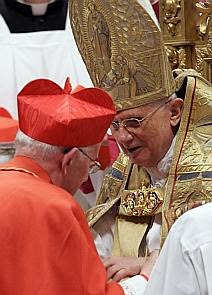 The Catholic primate Archbishop Seán Brady has been elevated to the College of Cardinals by Pope Benedict XVI at a ceremony in St Peter's Basilica. Archbishop Brady is the ninth new cardinal to receive the zucchetto - a skull cap - which was placed on his head by the Pope, and then a red biretta (a stiff square cap topped by three ridges - the so-called "red hat") over this. He will also then be told the title of the Roman church assigned to him, after which he will be formally greeted by his fellow cardinals. On his creation as a cardinal, the Holy Father, Pope Benedict XVI, assigned to Cardinal Brady the titular Church of St Cyricus and Julitta, who were martyrs. Addressing the media after the ceremony, Cardinal Brady said he was "honoured and humbled". He said priests and religious had a "unique and irreplaceable" role in society. "These have been difficult, at times traumatic, years for the Church in Ireland. Yet in the midst of these challenges, the overwhelming majority of priests and religious have continued to serve their people, in humble patience, with quiet devotion and outstanding generosity," he said. President Mary McAleese led the Irish contingent, accompanied by her husband Martin. Also present were Northern Ireland's Deputy First Minister, Martin McGuinness; the Secretary of State for Northern Ireland, Shaun Woodward; Minister for Foreign Affairs Dermot Ahern; and Government Secretary Dermot McCarthy. Both the Irish Ambassador to the Holy See, Noel Fahey, and his British counterpart, Francis Campbell, were also to attend. Mr Campbell, the first Catholic to represent Britain at the Holy See since the Reformation, is a native of Newry, Co Down. A large Irish Catholic Church delegation includes cardinals Cahal Daly and Desmond Connell, as well as the Archbishop of Dublin, Dr Diarmuid Martin; the Archbishop of Cashel, Dr Dermot Clifford; the Archbishop of Tuam, Dr Michael Neary; and 20 other bishops. Mrs McAleese said Archbishop Brady's elevation to Cardinal was a "much deserved honour" for a pastoral man of "great humility, underpinned by great scholarship". "Right around Ireland, it has been acknowledged as a very happy decision as it puts Ireland in the position, for the first time ever in our history, of having three cardinals. "That has to be a remarkable testament to the kind of faith-filled people the Irish are, to the kind of leaders that they have had in the Church, that at this time in our history, a very wonderful and grace-filled space in our history, we have the privilege of having three cardinals." On the possibility of a Papal visit to Ireland, the President said: "It's not for me to invite Pope Benedict to visit, that's strictly a matter of course for the Catholic Church. "What I have said on a number of occasions is, that if the Irish Catholic Church was minded to invite him to visit Ireland, he would find himself very welcome and everything that could be done to facilitate such a visit would be done." Taoiseach Bertie Ahern also paid tribute to Archbishop Sean Brady ahead of his appointment to the College of Cardinals. The 68-year-old becomes the third cardinal on the island of Ireland when Pope Benedict XVI honours senior churchmen with the traditional red hat. "Archbishop Sean Brady is fully deserving of the honour which Pope Benedict will bestow upon him," said Mr Ahern in advance of the ceremony. "As Primate of All Ireland, he has exercised his pastoral care in a thoughtful, modest but always compassionate manner." Mr Ahern paid tribute to Archbishop's particular leadership role in Northern Ireland and his tireless work on behalf of peace and reconciliation. He also recalled that Pope Benedict had, on a number of occasions, referred to the importance for the world of the success of the peace process in Northern Ireland. "Archbishop Sean Brady's role, especially in partnership with the leaders of the other Christian denominations, has played no small part in the message of hope which the Northern Ireland peace process represents," the Taoiseach said. Mr Ahern extended his best wishes to Archbishop Brady for the future of his ministry in Armagh and in the service of the Church generally.